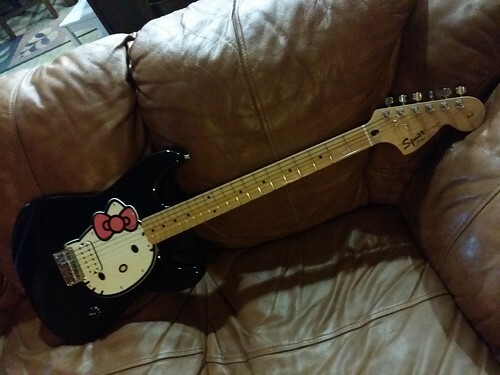 Honeyiscool inspired me to pick up this strat. It has stuff I did a lot already and wasn't expensive so seemed all win. I like the hard tail string through and figured it would be cool to have a simple single pickup guitar. 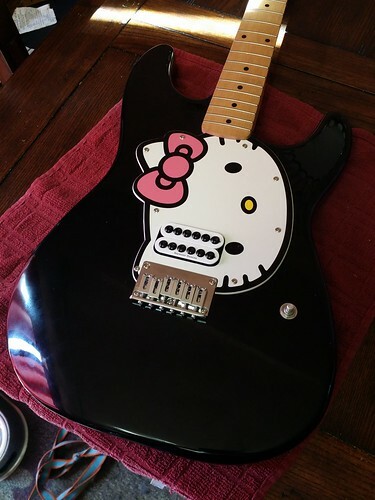 Kids and wife love the Hello Kitty aspect so it is pretty popular among my guitars currently. 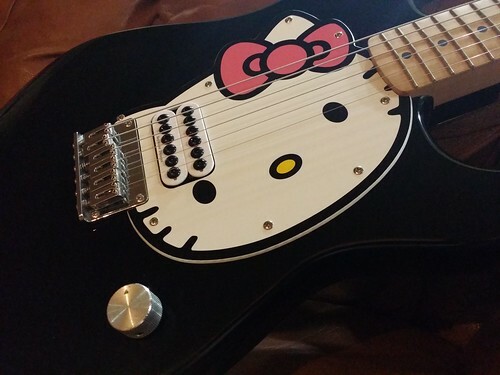 LOL I ordered a white invader humbucker and I am going to upgrade the volume pot and add treble bleed ala Tom Delonge. Don't see any reason to change out the jack. Should be a pretty awesome guitar when I am done. Only thing that bugs me is that it is body mounted as far as the pickup goes. If I get ambitious enough, I might just drill the guard so I can adjust it with normal screws. Honeyiscool have you done that? Probably will drill this hole out to fit a US pot vs the mini pot it had in there. 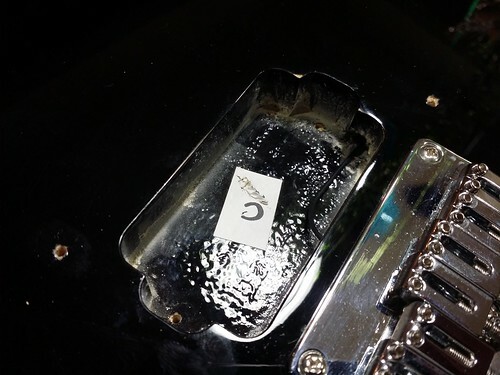 if you really need to raise the pickup, you could use the foam method instead. Haha that is cool man, the Invader makes it look badass. 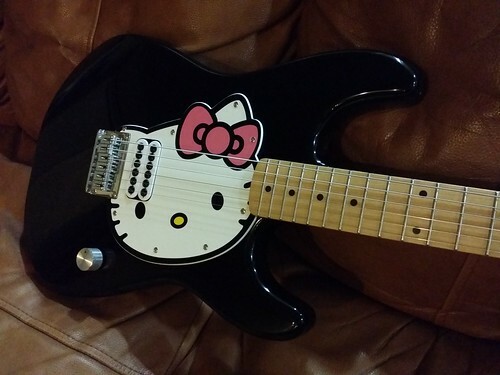 Without the pickguard, it could be a cool EVH kinda strat. All done (Aside from strap locks coming in Monday.) Sounds much better with the new pickup. I ended up screwing it all the way down because of the taller pole pieces to make sure I wouldn't strew up my string vibration having it too close to the strings. All the wiring went fine. Got the treble bleed installed. Put new jack wires. Since I put a solid shaft pot, I put this old silver knob on it. I think it goes well. Turned out nice! Cool! I hadn't looked at this forum in a while, so I didn't see this until just now, but really cool! 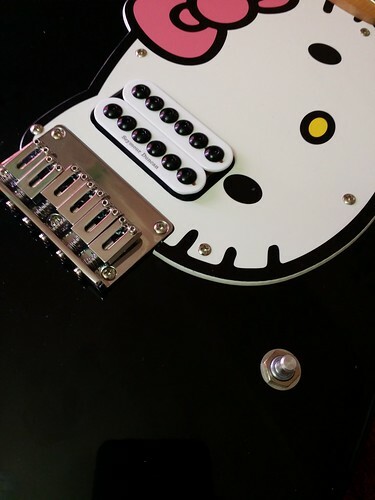 I actually did drill my pickguard for pickguard screws on my HK. Pretty simple. The cutout was also a bit too small for a Duncan pickup so I had to file it a bit, too. I believe DiMarzio pickups are physically smaller, however, because I don't remember having to do that with a Super Distortion. However, maybe you got a bit lucky with a bigger cutout. 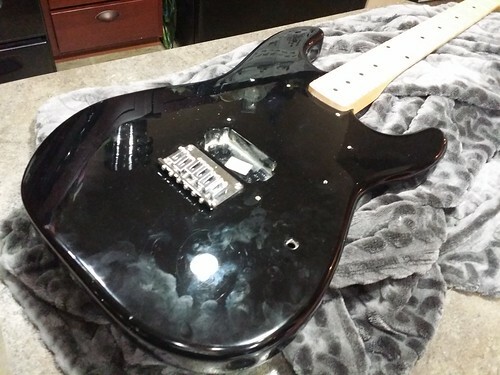 The main thing I hated about the controls was that there is this gigantic rear cutout, yet it's lined up in such a way that most of it is covered by the pickguard. If you don't want the knobs covered by the pickguard and you also want a tone control, you're pretty much forced to use a stacked control. Which I did and didn't mind, but that's besides the point. I wish they gave us another option to drill for a separate tone knob, would have much preferred. 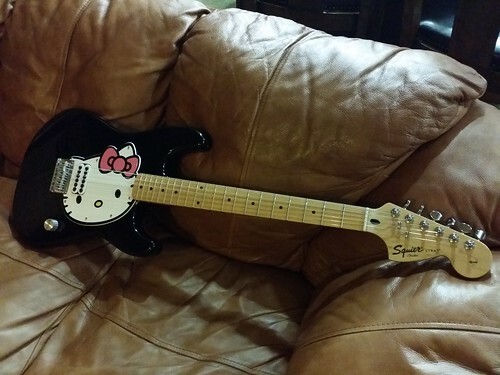 Anyway, congrats on your guitar. I always loved mine. 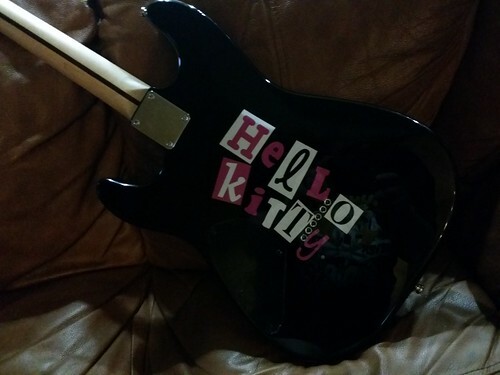 When I rebuilt it as a Jazzmaster using my original pickguard, it kept me in touch with what I loved about my first HK guitar (well, my first guitar, period) and I've played it at two shows already. 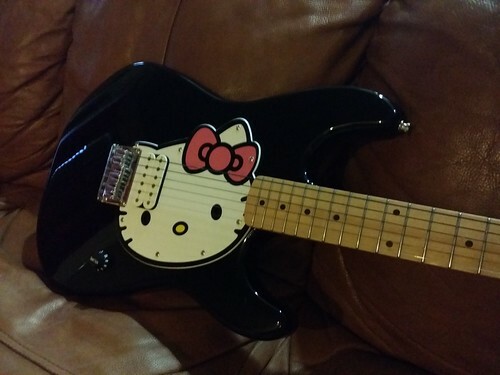 I use a Duncan Custom and it really works (though the HK Jazz has a neck pickup which I use almost all of the time in combination). I ended up with the pickup about 1/8 of an inch away from the strings. It is a little low, but sounds good. I basically used pickguard screws to screw it to the body. Since the legs of the pickup were longer than the stock one, it seems to be ok. The output on this is high enough and the magnets are so large that I think it is ok as is. I kind of wish I had done normal holes in the guard, but to be honest, the pickup only needs a tiny lift from being flat on the body so I decided not to bother with that. I love your jazzy version. It is really cool. I don't miss a tone knob. Almost all my guitars have them, but to be honest, I never turn them down. I do sometimes turn volume down to clean up an overdrive so this works ok but I do agree with the back cavity being poorly made. It is super huge just for the one pot. 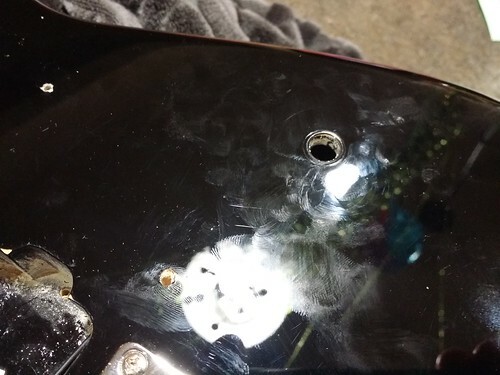 Not sure why they just didn't do a tele shaped rout and a smaller skinny back plate? 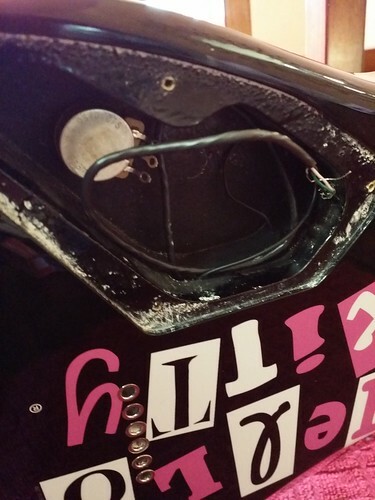 Seems like a lot of extra work for a Squier to have a sort of specialized back plate. Cool! Yeah, I think one of the benefits of having the pickup far away from the strings, too, is that it naturally gives the pickup a more muted, full bodied sound, which probably means you need the tone knob less. 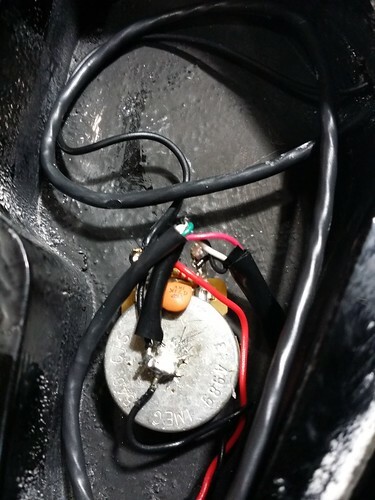 Had you installed the pickup much closer to the strings, you'd probably find that you might need a tone knob now and then. All they needed to do with the back cavity was just have it more offset so there was more usable space that I could fit more controls in there. Warmoth Strat bodies actually do that.